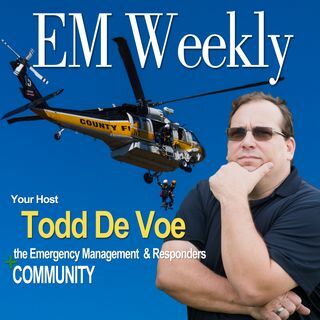 This is a special edition of EM Weekly. It is the first of series of webinar-based discussion panels that we have planned to the EM community and it is completely free for you and the guests on the panel. Some webinars are 45 minuet ads about a product that you may or may not have any interest in. Here at EM Weekly we wanted to bring you an entire different experience a more interactive experience. You get to engage in the conversation as it is going on. No boring PowerPoints and Like I said no ... Más informaciones product sales pitch at the end. The following webinar is sponsored by the Emergency Management Leaders Conference (EMLC) That is this May 29th though the 30th in Phoenix AZ. Go to emlc.us to sign up today.